Enzo Maccarinelli is looking for a new opponent for his ExCeL London bout on Saturday after Johnathon Banks withdrew with an ankle injury. The Swansea fighter still hopes to challenge for the vacant WBO cruiserweight crown, which he lost to Londoner David Haye in March. US fighter Banks was training in Spain with Vitali and Wladimir Klitschko and hurt himself during a training session. Maccarinelli's promoters Sports Network plan to announce a new opponent soon. A statement from the promoters read: "Enzo Maccarinelli is looking for a new challenger for this Saturday at the ExCeL London after Johnathon Banks withdrew with an ankle injury. "The hard-hitting Welshman still headlines the show and challenges for his previously held WBO world cruiserweight title. A new opponent will be announced shortly." 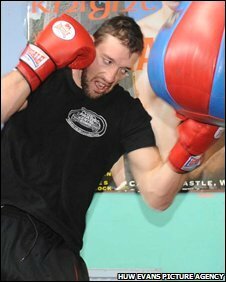 "I have been training twice as hard since the David Haye fight," said 28-year-old Maccarinelli. "I don't think I've ever hit this hard, and I've had to hold back a bit there's so much in my punches." Maccarinelli is desperate to make amends for his second-round knockout defeat by Haye at the O2 Arena. He still hopes to have the opportunity to make up for that loss with a tilt at the WBO title, which Haye vacated in order to move up to heavyweight. The Welshman has been on a strength and conditioning programme ahead of the fight which has seen his body mass index drop dramatically - and his muscle density increase two-fold. "It [losing to Haye] made me realise how much I love this sport, and the Monday after the fight I was back in the gym," he said. "I've been doing all my usual runs and fitness programmes with the boys from the gym, but have looked to improve my strength as well. "I've been chopping logs and dragging tyres around to make me stronger, and I've already seen the effects in sparring."